7 Brand Cigars are loved by so many, especially the cigar smokers who like the Acid cigar line. The 7 Brand cigars are a super boutique brand that is distributed by the famous Cigar Agency up in the New England Area. 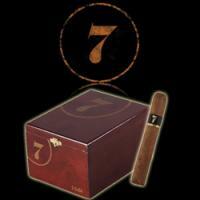 The 7 Brand cigars are a hand rolled premium cigar that are aged for 9 months in Whiskey Barrels prior to packaging. The 7 Brand cigar has creamy finish with a outstanding combination of a sweet mash whiskey and vanilla flavor, so if you're a fan of the Drew Estates or Acid cigars then the 7 Brand cigar is right up your alley!